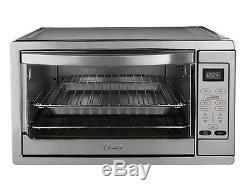 Oster Extra Large Digital Toaster Oven Convection Bake Stainless Steel Pizza. What's in the Box. 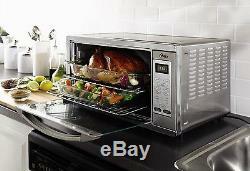 Oster toaster oven, removable baking pan and broil rack, 2 removable wire racks, user manual. A useful addition to any busy kitchen, Oster's extra-large digital toaster oven--beautifully housed in brushed stainless steel--takes counter-top cooking to a whole new level. Whether it's the holidays and relatives are gathering for a celebratory feast, or it's simply a Tuesday night and a quick healthy meal is on the menu, the counter-top oven offers a roomy interior and exceptional versatility that not only accommodates, but also inspires. Stylish brushed stainless steel finish. 90 minute timer with automatic shut off. Accommodates family sized pizzas, roasts, chicken, or casseroles. Extra-large capacity will hold a 9-inch by 13-inch casserole dish. 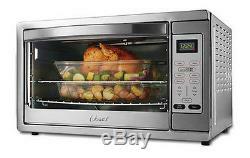 The extra-large toaster oven measures 20 inches long by 24 inches wide by 13 inches high. 150 to 450-degree temperature range. The toaster oven works well as a second oven or as an energy-efficient alternative to turning on the full-size oven, though no need to think small thanks to its extra-large interior. Bake anything from a family-size 16-inch frozen or take-and-bake pizza to a whole chicken, a 13-by-9-inch casserole, or a pan of bread sticks or cinnamon rolls. It can even toast up to 14 slices of bread at a time. The oven provides a removable baking pan and broil rack for baking, broiling and grilling, as well as two removable wire racks that slide neatly into place. Two oven-rack positions allow for multi-level cooking options--use just one rack in the lower position (great for cooking a tall roast) or both racks simultaneously (better for busting out batches of oatmeal chocolate-chip cookies). Digital Controls and Convection Technology. Digital controls keep things simple for both the novice and experienced home chef alike. Simply press the easy-clean touch-pad to make the desired selection. Functions include Toast, Bake, Broil, Warm, Defrost, and Pizza. There's also a Convection Bake setting that uses turbo convection-heat technology, which means more even browning and faster results--without compromising on quality. With Convection Bake, hot air circulates throughout the oven's interior, just like with a high-end full-size oven, which means it's possible to effortlessly achieve juicy meat and flavorful, gently cooked vegetables, as well as crispy edges and flaky crusts. The toaster oven provides a variety of mouthwatering recipes like brie and artichoke bruschetta, cinnamon toast, and honey mustard chicken with spicy pecan corn-flake crust, as well as mustard and herb pork tenderloin with roasted potatoes and roasted turkey breast with aromatic vegetables. Attractively housed in brushed stainless steel, the extra-large toaster oven measures 20 inches long by 24 inches wide by 13 inches high. We use different suppliers across the US to ensure your item is delivered as fast as possible. Thank you, FABB BY DESIGN. The item "Oster Extra Large Digital Toaster Oven Convection Bake Stainless Steel Pizza" is in sale since Wednesday, May 2, 2018. This item is in the category "Business & Industrial\Restaurant & Food Service\Commercial Kitchen Equipment\Cooking & Warming Equipment\Ovens & Ranges\Pizza Ovens". The seller is "fabb-by-design" and is located in New York, New York. This item can be shipped to United States.